Paṇchen Sönam Drakpa (Tib. པཎ་ཆེན་བསོད་ནམས་བསོད་ནམས་གྲགས་པ་, Wyl. paN chen bsod nams grags pa) (1478-1554) — an important scholar who is well known for his New Red Annals. He was a student of the second Dalai Lama Gendün Gyatso, and a teacher of the third, Sonam Gyatso. He was the fifteenth Ganden Tripa and became the throneholder of Drepung Monastery in 1542. He is the only one who has ever served at abbott at the three main Gelug monasteries: Ganden, Sera and Drepung. 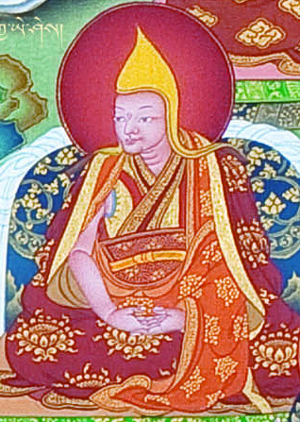 His textbooks (yigcha) are studied particularly at Drepung Losel Ling, Ganden Shartse, Gyütö and Ratö monasteries. This page was last edited on 17 February 2017, at 23:13.